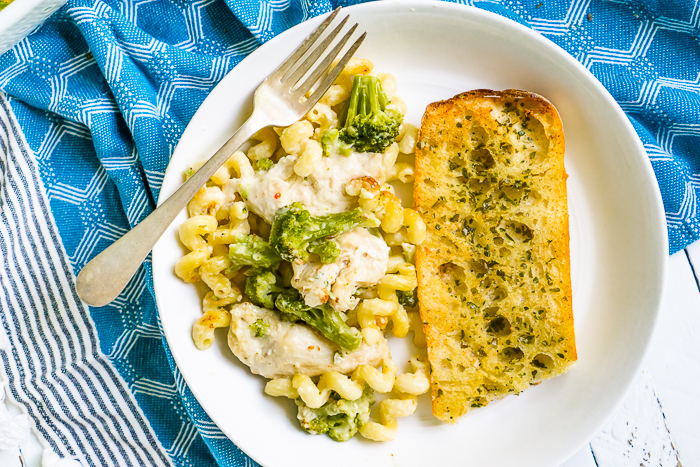 With under 15 minutes of prep work, you can enjoy a tasty Four Cheese Chicken and Broccoli Pasta with the easiest homemade garlic bread! It’s a delicious dinner solution that’s perfect for busy nights when you still need to get dinner on the table for the family! 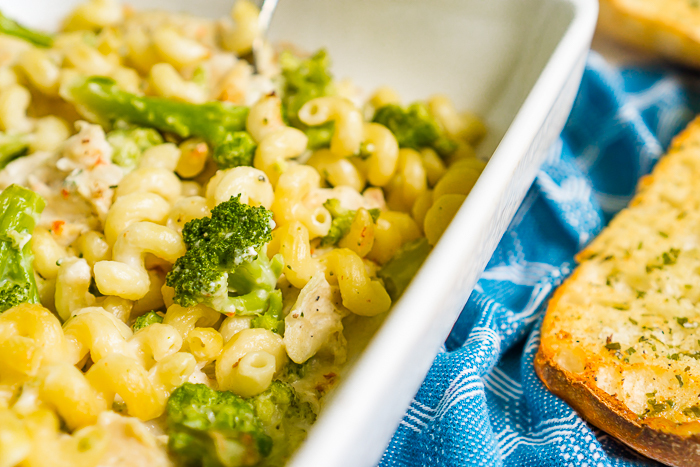 THIS EASIEST GARLIC BREAD RECIPE IS THE PERFECT PAIR TO TYSON® FROZEN DINNER KIT – FOUR CHEESE & BROCCOLI PASTA! I’ve talked about it a couple times lately, but I am on a mission to find some easy meals I can keep in the freezer for long days that are short on meal prep time. With the long house to do list that includes workers in and out of our house and destroying our kitchen pantry in a couple weeks on top of the normal work, life and mommying requirements, we have started relying on take out or unhealthy dinner options too much. I need dinner solutions that require almost no work from me and the new Tyson® Frozen Dinner Kits are fitting that need, especially paired with the easiest garlic bread recipe. Liam and I were browsing Target for like the 5th time this week when we stumbled upon the bags in the freezer section. There were three flavors: Four Cheese & Broccoli Pasta, Sweet Chipotle Chicken & Vegetable Hash, and Tomato Herb Chicken & Vegetable Pasta. 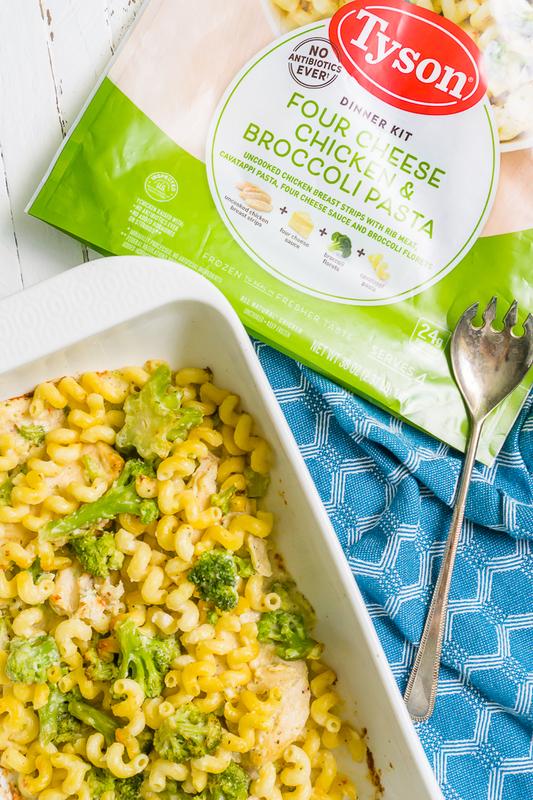 As a huge broccoli fan, I picked up the Tyson Frozen Dinner Kit – Four Cheese Chicken & Broccoli Pasta to try first and am so glad I did. It was so tasty! You should pick up a kit to try yourself next time you’re in Target; there is even a Cartwheel coupon for 20% off for you to use! The first thing that struck me as I prepared this meal was how good everything smelled coming out of the packaging. You could really smell the herbs and cheese! The second thing is how easy prep work is for this frozen dinner kit. Prep work on my end took maybe 10 minutes, which included warming up the sauce bag with hot water while the oven warmed up, layering all the ingredients in a casserole dish, covering with aluminum foil and then stirring half way through. That’s it! It was so easy on my end! The meal cooked in the oven for 40 minutes and then sat for 5 while I cooked my super easy homemade garlic bread. The pasta sauce thickened and dinner was good to go! Anything that requires so little of me or, even better, so little of my husband on a busy night makes me very happy! Because eating this Tyson Frozen Dinner Kit is a much better easy dinner solution for us than a drive through burger or delivered pizza. Tyson Frozen Dinner Kits are made with premium ingredients that are pre-portioned for us and frozen to seal in the freshness. Plus the chicken used is raised with no antibiotics ever. 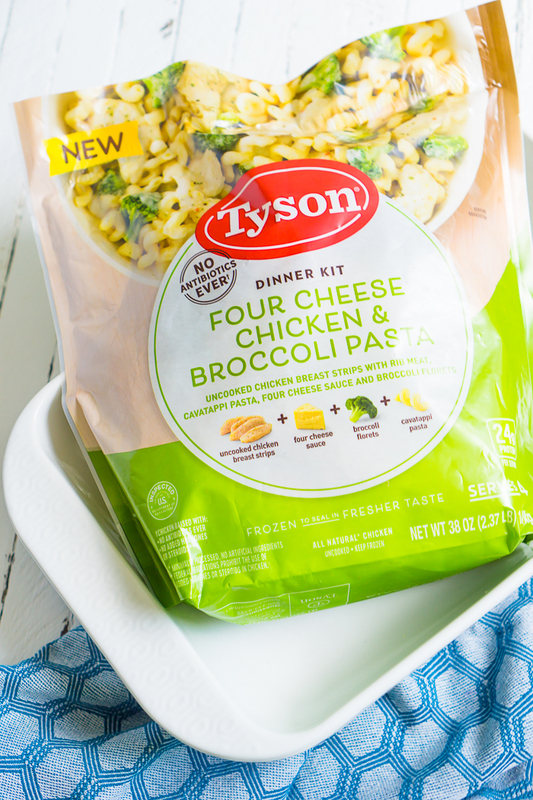 The Tyson Frozen Dinner Kit – Four Cheese & Broccoli Pasta comes with uncooked chicken breast strips, broccoli florets, cavatappi pasta, and four cheese sauce. The best part? Everything you need is included in the Dinner Kit! 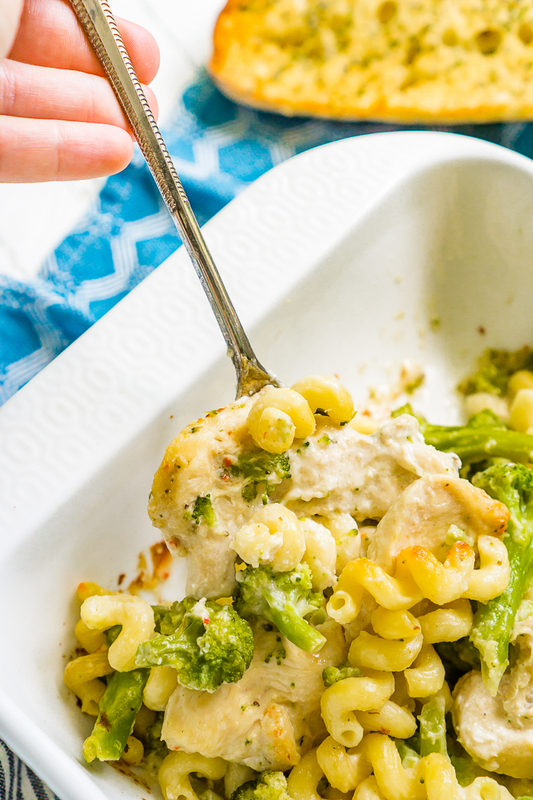 I love a creamy pasta with garlic bread, so I decided to prepare the Tyson Frozen Dinner Kit – Four Cheese Chicken & Broccoli Pasta with the easiest garlic bread recipe! There are a lot of tasty garlic bread recipes I love, especially cheesy ones, but this is my favorite homemade garlic bread recipe in our house because it requires all pantry staples for us so no ingredients go wasted. There is just no way I’m going to buy a full bundle of parsley for one loaf of bread. Plus it pairs perfectly with the Tyson four cheese sauce! Now, Let’s Make The Easiest Garlic Bread for the Tasty Four Cheese & Broccoli Pasta Dinner Kit. 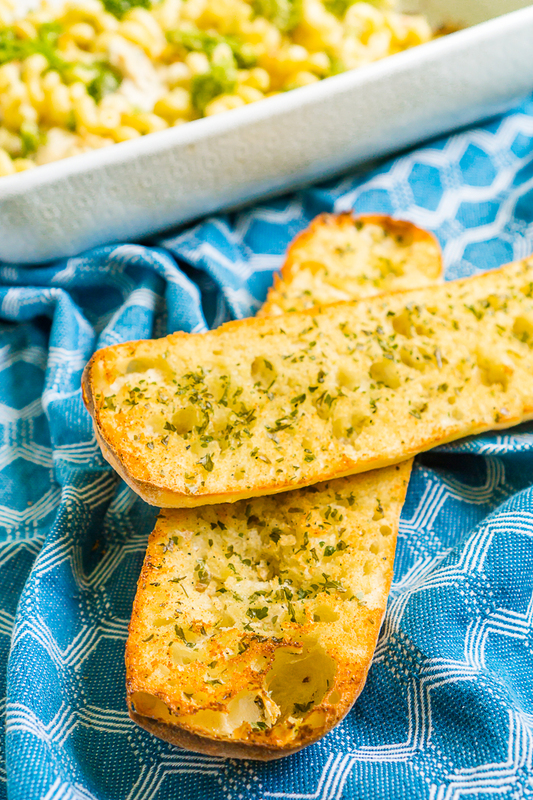 This is the easiest garlic bread recipe made with simple pantry staples! It's our favorite go-to recipe and pairs perfectly with pasta dinners! Slice bread loaf in half. Then butter each side evenly with a thin layer all the way to the edges. Sprinkle with an even layer of garlic salt, ground black peppercorn, and dried parsley. Place on baking sheet and cook for 5 minutes or until golden brown.